Towns in Cape Cod are looking to shellfish not only as culinary treats, but as a way to help clean up waters suffering from excess nitrogen. Nitrogen is an essential nutrient for plants and animals, but too much nitrogen—often from fertilizer runoff and septic tanks—boosts the growth of algae, which overwhelm water bodies and ultimately reduce oxygen levels in them. Oysters, clams, and other shellfish are efficient filter feeders that help remove excess nitrogen from waters by incorporating it into their shells and tissue as they grow. Towns are considering seeding and growing shellfish as a way to reduce nitrogen levels in coastal waters because they are a cheaper and faster alternative to building sewers and wastewater treatment systems that could cost billions of dollars, said Joshua Reitsma, a marine specialist with the Woods Hole Sea Grant Program and Cape Cod Cooperative Extension. Adult oysters reportedly can filter up to 50 gallons a day, while large quahogs (hard clams) can clean about 24 gallons of water a day. But how much nitrogen ends up in their tissue and shells? That represents how much nitrogen would be removed from the water when the shellfish are harvested. 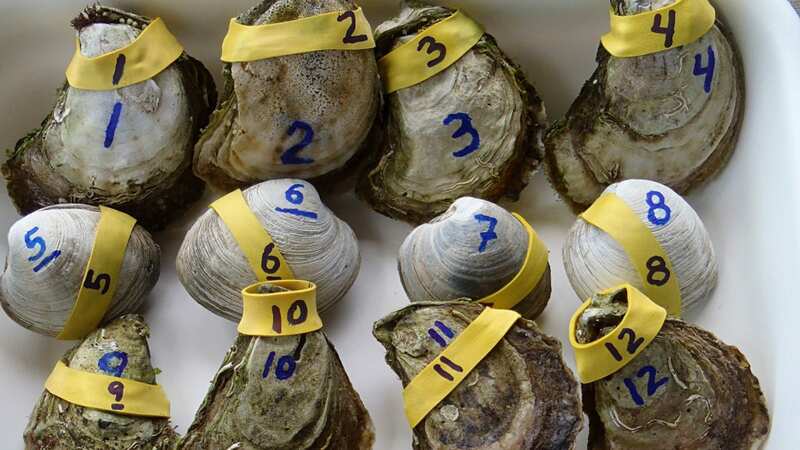 To find out, Sea Grant and Cooperative Extension researchers joined with the Mashpee Department of Natural Resources to measure the nitrogen removal capacities of shellfish harvested from Cape Cod waters. 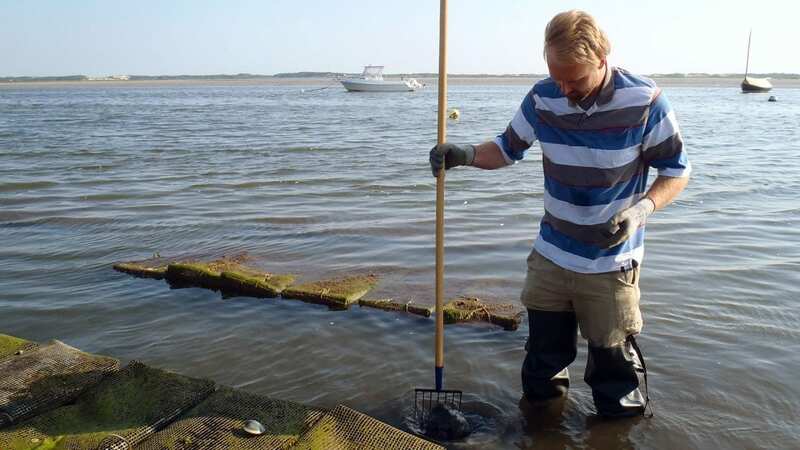 They gathered samples of both wild and farmed oysters and quahogs from various water bodies in Cape Cod. Their analyses showed that individual oysters, on average, contained .28 grams of nitrogen, and quahogs contained .22 grams. Wild oysters and those grown on pond bottoms contained an average of .32 grams of nitrogen—more than those grown in floating cages. “Multiply those numbers by the number of shellfish harvested and you can assess how much nitrogen is removed from the waterways, and how much less nitrogen has to be removed by other means,” said Matt Charette, director of the Woods Hole Sea Grant program. Shellfish harvested in the fall incorporated more nitrogen, which Reitsma said wasn’t a surprise, since oysters and quahogs tend to “fatten up” in the fall in preparation for the winter season. “Theoretically, you could maximize the amount of nitrogen removed by harvesting in the fall rather than in the spring, when the shellfish tend to be skinnier,” he added. Oysters and quahogs used for cleanup from approved waters are still safe to eat, said Diane Murphy, a Cape Cod Extension fisheries and aquaculture specialist. “Using shellfish is not only a low-cost alternative for nitrogen cleanup, it offers economic benefits of jobs and revenue for shellfish growers and restaurants,” Charette said. But the researchers stress that shellfish aquaculture should be considered just one part of the long-term solution for reducing nitrogen in waterways. Reitsma, Murphy, and co-authors Abigail Archer of Woods Hole Sea Grant and Cape Cod Cooperative Extension and Richard York at the Mashpee Department of Natural Resources published their study in January 2017 in the journal Marine Pollution Bulletin. The research was supported by the Barnstable County Cape Cod Cooperative Extension, and Woods Hole Sea Grant.